My daughter likes cats? Why? I do not know? She thinks they are cute. I don’t. I personally only know 2 cats. No 1 was the cat of a flatmate about 20 years ago. She peed in my bed. Twice. Because I had offended her by leaving her alone to attend a lecture at university. No 2 does worse in our garden. Probably because we have offended her by not letting her in our flat. Let me just point out that I am not the owner of said cat. I just happen to live in the neighbourhood. Why am I telling you this? Oh, yes, we were talking about cats. So my daughter likes them and as the loving and caring mother I am about 50% of my time, I thought I could make a top for her out of Mademoiselle Chat by Lillestoff, designed by Tante Gisi. It is a rapport fabric, featuring a giant cat head rather than a small print pattern. Already it looked giant for my skinny girl so I was looking for pattern for an oversized shirt to make sure that the whole cat fits on her tiny chest. And I found a lovely layered top, Lotty by kibadoo (so lovely that I bought the grown up version, too). What I did not realise until I opened the folded piece of fabric, there were actually two giant cat heads rather than just one for the front of the top and lots of background for back and sleeves as I had expected it. Now, this is no ones fault obviously, I am not experienced in these kind of fabrics and wasn’t even aware of the different options and that it would be worth to check. The main reason why I do not like these types of fabric is that you can not use them very economically. There are always giant pieces left that are hard to use up. And this has really been my main goal the last couple of weeks. To get more space in my stash cupboard. So, it was just reeeeally annoying, that the one time I was thinking I could use only one piece of fabric and actually use it up, I actually had to buy two more pieces, one for the top layer and one for the top peeking out. Which meant I ended up with three huge pieces of left overs. Lots of moaning, I know. But if you are living in Vienna you are legally obliged to spend at least 80% of your time being grumpy. However, without that silly fabric saving background story, I am really pleased with the result. I do love the top, even if there is a cat grinning at me whilst probably secretly planning where to leave her next surprises. I am really pleased I have been forced to looking for a new pattern. I have always been a fan of layers but I am not particularly fan of tracing patterns in 50 different sizes. Obviously it looks much cooler when worn but that would mean changing the complete outfit and finding a competent photographer which seems far too much effort at the moment. So, I’ll leave it to your imagination. Just let me tell you that I find it so cool that I have already cut out the next combination, I simply haven’t got the time to sew it as I want to finish my private charity project first. As promised, my outfits for baptism and wedding. As you might remember, I need breastfeeding friendly dresses. Good news is that I have lost weight, apparently. Bad news they are rather complicated to alter, so if I do it, then only once, so I might as well wait for next summer. A couple of weeks ago, I showed you this Gloria by Milchmonster. It’s a Gloria by Milchmonster. I bought the fabric last year, when I got the one you saw in the first picture. They come from the same collection “Eden” by Hamburger Liebe. I guess you could call them relatives. Cousins maybe. So now only the most important outfit is left to get shown. But it is not finished yet. Tomorrow is button shopping day. I guess it will get rather sparkly. 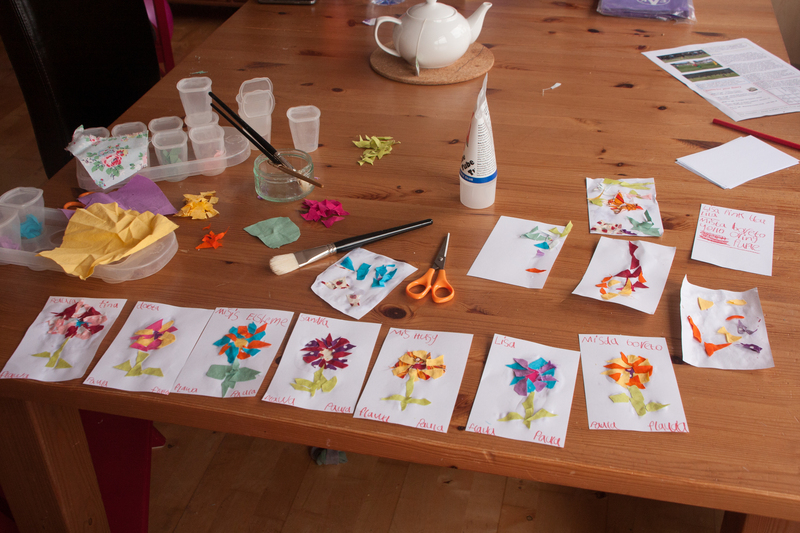 Whilst I have been quiet lately, I have actually been rather busy and it is time to catch up. I have recently found a rather cool way to use up scrap fabrics and also to make a first step on the trousers making ladder: Shorts. To cut it short: I have used the free pattern Sachensuchershorts (” things seeker shorts”) by Fabelwald. There are two types of pockets on offer, I have, so far only tried my favourite one. Fabric: Could be by Lillestoff, but I might be wrong. But definitely a left over of my cozy and slightly pyjama-y long sleeve shirt. And some stripes. Fabric: Lillestoff. I own it since ages, almost two years I would say. Initially bought for a onesie but ended up as at least two baby jumpers. Ordered in England, without knowing it was Lillestoff. Or caring about Lillestoff. And stripes, well spotted. Fabric: Baustelle by Lillestoff. This has been sold out quickly. I ordered on my phone, quickly, to make sure I would get some of this precious fabric. And yet more stripes in case you didn’t notice. I had been a little bit unsure and thought they might be too short and too flimsy to be used properly but actually they are not. They have all gone through extensive testing and they get worn a lot. Yesterday, I was accused of being obsessed by scraps and of only buying fabrics to produce scraps!!!! Can you believe it?! This is obviously not true! At all! If I ever bought new to have scraps than I would obviously just buy remnants like these that otherwise would die a lonely death in a shelf. So really I am not only saving a poor piece of fabric but also supporting the shop owner in her attempt of decluttering. And it has definitely nothing to do with me wanting to have more scraps… but now, thinking of it, I have just tried to save one of these pieces. After complaints from my personal stylist that my maternity T-shirts are all white, black or, even worse, grey, I thought I’ll try to adapt a normal pattern to my recent body shape. So, I used a pattydoo sleeveless top pattern for the first time and made it a few inches longer and the front a few inches wider around the middle. So far, so good. I think that went reasonably well, still a bit room to stretch. And I am also thinking that it will be fairly easy to just take away all those inches next summer. 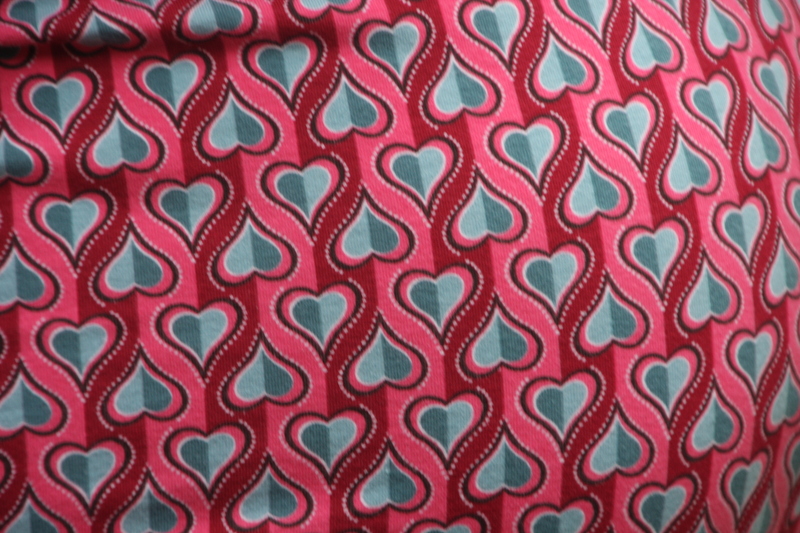 Otherwise it would have been a bit of a waste because it happens to be a beautiful Hamburger Liebe fabric. 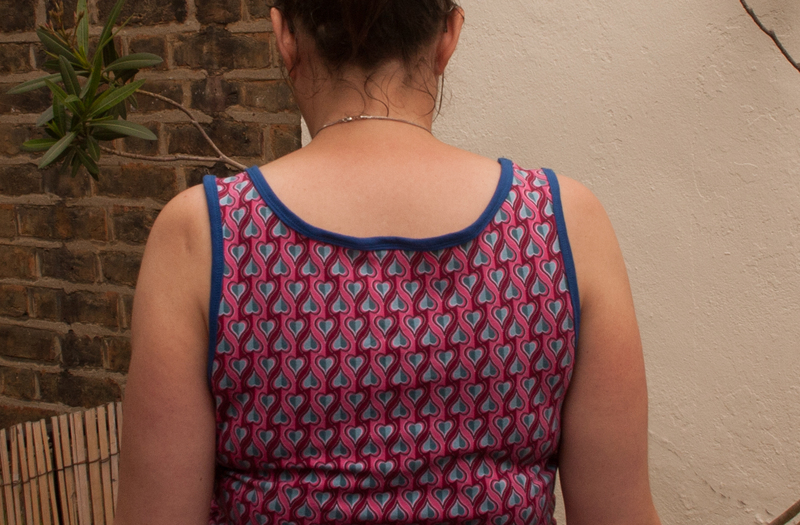 I have also adjusted the top section as I know from previous experience with any bought standard sized pattern that I seem to have unreasonably narrow shoulders. So all necklines will be too wide, shoulder straps will slip down from my weird shoulders and it will just not look like something that was made especially for me. So I also decided – without having used this pattern before – to narrow the neckline and to just take the shoulder straps a bit more in. Before you are getting all clever and “you shouldn’t alter without knowing the pattern bla bla bla”, I can inform you that actually I was right, in fact, I should have taken them in even more. Obviously I could get away with it but I know that every time I wear it, I will be super consciously trying to constantly arrange things. Not really worth it. I am relatively new to this type of shirts and elastic bindings. I wish I would have invested time in research as I think closing the seams before putting in the bindings would be much neater. Not only would I not have the side seam showing on top of the binding but also, I would have seen how it fits and would have been able to make adjustments before finishing the binding. Now the armhole binding is locked with a overlocker seam and the neckline is also blocked by a shoulder seam. If I want to open things and do it better, it will get really complicated. I am considering to pull the straps up and add a new seam, that could actually work fairly well, it just might get a bit thick at the shoulder seam. The only other option would be to dismantle to whole thing and I am not sure if I fancy that. 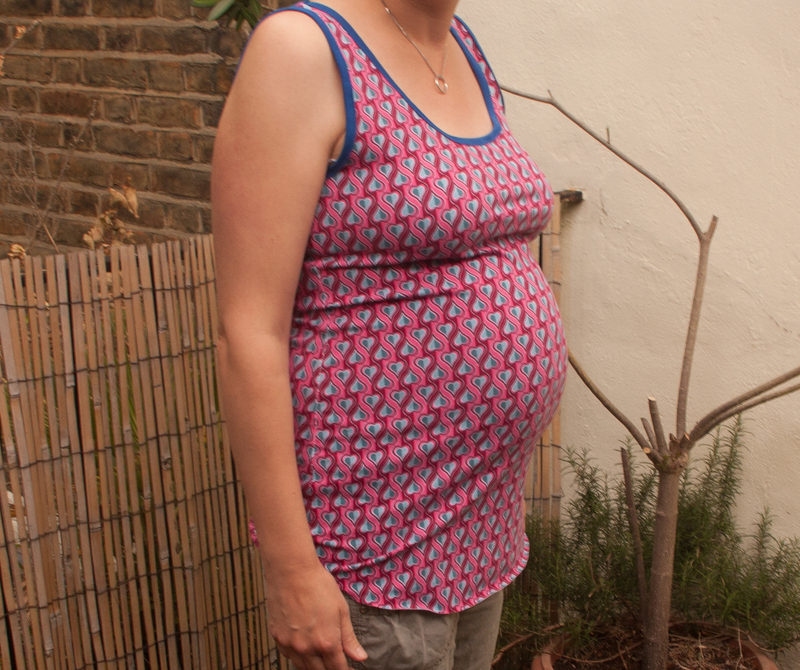 I do however like the idea of my patterned not so boring maternity top and would make another one. Not sure if I should make something with sleeves though as I am currently staring into torrential rain. Well, I guess there would be one other option, which would also sort out all future pattern problems…. plastic surgery to broaden my shoulders. I still think this is actually the best way to use up scraps. Except that you are only using tiny bits so it is really something for people who want to super efficiently use up every single square inch of their fabrics.